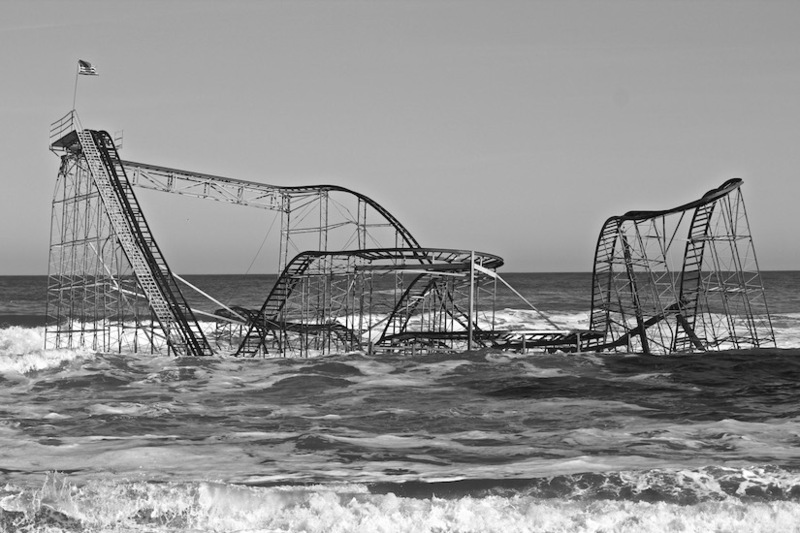 Jetstar Rollercoaster in Seaside Heights, New Jersey, after Hurricane Sandy. 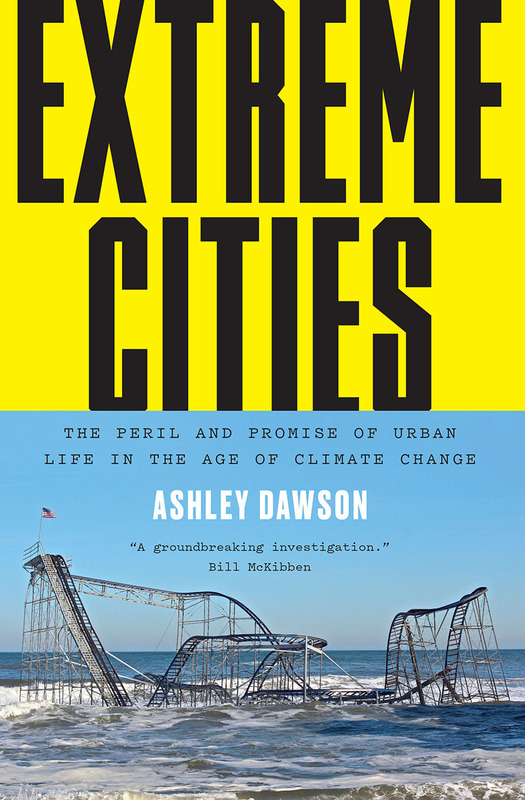 In Extreme Cities, Dawson offers an alarming portrait of the future of our cities as both the places where climate change will have its most devastating effects and as the necessary sites of crucial response. Extreme Cities is one of our core texts on our Environment and Ecology Student Reading List and 50% off for the month of September as part of our Back to University sale. It was named one of the Top 10 Books of the Year by Publishers Weekly and Planetizen. Here we present the book's introduction. I found a huge blister of water forming on my bedroom wall when the wind woke me in the middle of the night. Hurricane Sandy had been buffeting the city all day, and as nightfall approached I hunkered down in my apartment in Jackson Heights, Queens, hoping that my neighborhood’s elevation would bring a degree of safety. The previous day New York City Mayor Michael Bloomberg had ordered the evacuation of everyone living in flood Zone A, a total of 375,000 people, and by evening the city halted all subway service, marooning people without cars in their neighborhoods. There was little to do the following day, Monday, 29 October, other than to fill the bathtub with water, stock up on batteries, and watch the sky over the city ominously darken. When the full force of the storm hit that night, the intensifying winds drove rain into the bricks and mortar of my building, which age had rendered all too permeable to such a sustained onslaught, producing a threatening bulge in the paint of my bedroom wall. I prodded the blister gingerly and mopped, slept fitfully, and then was awoken by the winds raging outside to find the blister growing larger again, in what seemed like an endless cycle. By morning, I felt exhausted but fortunate to have escaped the hurricane relatively lightly. We still had power, and taxis and delivery trucks rolled through the streets. But other portions of the city had sustained major damage. The superstorm drove a wall of water into the financial district of Manhattan, capitalism’s great citadel. Sandy’s fourteen-foot surge had flooded a power substation in Manhattan’s Lower East Side, causing a catastrophic short circuit that cut off electricity to all of Lower Manhattan. The surge had also inundated many low-lying areas: Red Hook, the Navy Yard, Brighton Beach, and Coney Island in Brooklyn; areas around Jamaica Bay in Queens, including the Rockaways, a barrier island where the community of Breezy Point was utterly destroyed by a fire started by short-circuiting electrical equipment. On Staten Island, a borough still mourning losses from 9/11, beachside communities like Ocean Breeze and Oakwood Beach had flooded catastrophically. In the days following Sandy’s landfall, it became clear that it had been one of the most destructive storms ever to hit the United States. The storm killed 160 people in the New York metropolitan region and caused $65 billion in damage. New York City suffered cataclysmic breakdowns in basic infrastructure and services, including the flooding of the subway system and most major roads entering Manhattan; the destruction of hundreds of homes and a quarter million vehicles; and a power outage that plunged all of Manhattan below 14th Street into an eerie darkness for days. Hurricane Sandy accomplished what the Occupy Wall Street protests had been unable to do the previous autumn: it shut down the world’s preeminent financial hub, the New York Stock Exchange. The uncanny sight of downtown Manhattan’s spires plunged into darkness was an unmistakable signal that something had gone deeply awry. The prostration of New York left me with turbulent emotions. I felt fortunate (as I had on 9/11) that my neighborhood escaped almost totally unscathed, but the city itself suddenly seemed vulnerable: the sense of certainty that underlies quotidian urban life had been dramatically interrupted. I also felt disconnected from the rest of the city: the subways did not start running again for days; I couldn’t reach friends who lived in downtown Manhattan, since their power was out and their cell phones weren’t working; and without a car, I didn’t know what was being done to help people in the most damaged areas. The city’s immense size, and its disconnected and disjointed character, became painfully evident as life unfolded in my neighborhood with striking placidity, while in some other neighborhoods, those who lived above the 5th floor had no access to drinking water. I would later discover that people I knew had been displaced by the hurricane. My colleague Fred Kaufman, a resident of downtown Manhattan, had already spent years struggling with the disruption caused by 9/11: being forced to move out, then dealing with endless construction and associated pollution once he was able to move back in. Hurricane Sandy devastated the neighborhood afresh. Many of the small businesses Fred frequented were inundated by a fifteen-foot storm surge. Billions of dollars of property had been damaged. The FDR Tunnel, not far from Fred’s apartment, was completely filled with water, as were most basements in the area. The noise of diesel generators pumping that water out was constant, day and night. But when I asked Fred about the psychological impact of this experience, he seemed relatively resigned. The experience of Sandy was frightening, he said, but in many ways it is constantly frightening to live in downtown New York. When disaster strikes, no amount of money or advance preparation is going to save you; at the end of the day, you have to be able to walk out of the disaster zone on foot. What matters most is knowing how to get out and having friends who can support you once you do. Yet life returned to normal for him in a matter of days. Just across the harbor, the people of Red Hook, Brooklyn, had a different experience. Sheryl Nash-Chisholm, a Red Hook resident, watched with trepidation as the water advanced up Columbia Street toward her home on Monday night. Scenes of people on rooftops after Hurricane Katrina were not far from her mind, but she put on a brave face for her family. Still, when the lights went out, they were all terrified. How far would the floodwaters rise? They lit some candles and huddled, sleepless, until dawn. Once the storm passed and they were able to leave home, her son discovered that his car, the pride of his life, was totally submerged, a complete write-off. Sheryl did her best to console him. The devastation in Red Hook was vast. When Hurricane Sandy struck, the New York City Housing Authority (NYCHA) had shut down elevators, boilers, and electrical systems in public housing complexes across the city, including those in Zone A neighborhoods like Red Hook. With roughly 8,000 residents, NYCHA’s Red Hook Houses complex is the largest public housing development in Brooklyn. When the power went down, the heat turned off and the water stopped running, leaving the residents of Red Hook Houses in life-threatening conditions. The morning after the storm, Sheryl headed over to the Red Hook Initiative (RHI), a community organization dedicated to empowering the youth of the neighborhood. She is one of their key organizers. The building, unlike many others in Red Hook, was largely spared flooding during the storm and had also kept its power supply, so after failing to reach the Federal Emergency Management Agency (FEMA) on the phone, Sheryl began coordinating with residents of Red Hook Houses to turn RHI into a hub for the community. Within hours, RHI was providing power for charging cell phones, so that community members could let family members elsewhere know that they were okay. The building also provided a warm space, where residents of the chilly public housing complex could escape hypothermia. By the end of the day, hundreds of volunteers with what would become known as Occupy Sandy had arrived at RHI on bicycles, bringing much needed donations of batteries, candles, blankets, and canned food. A colleague of Sheryl’s organized medical delegations to Red Hook Houses to check on elderly residents who needed medical attention, fresh medical supplies, and even basic needs like drinking water and food. For the next three days, RHI was the principal center for organizing the community, gathering donations from around the city and delivering food and other supplies to needy people living in public housing and other parts of Red Hook. For Sheryl, it was an exhausting but exhilarating sequence of days, a time in which her personal energies were strained but her faith in the solidarity of her community was reaffirmed. The federal government and relief agencies like the Red Cross would not arrive in the neighborhood with supplies for many days. The stories of Sheryl, Fred, and myself highlight the precariousness of urban life in the face of climate change–induced disasters like Hurricane Sandy. After Sandy, endemic subway delays from heavy rain would no longer seem like mere temporary inconveniences, but rather prologues to a permanently drowned city. We wait anxiously for the next superstorm, fearing that the efforts of officials to prepare the city will turn out to be inadequate. And these Sandy narratives also dramatize the diversity and disparity of experiences of urban space and community during a disaster. In Extreme Cities, I place Hurricane Sandy in a broader context, weaving together stories of cities around the world that are threatened by climate chaos. Extreme Citiesdraws on interviews with researchers at the cutting edge of climate science, landscape architects whose work uses natural processes to build our capacity to endure extreme weather, and activists fighting to diminish the inequalities that render cities vulnerable to climate chaos. Cities, I contend, are at the forefront of the coming climate chaos, their natural vulnerabilities heightened by social injustice. Cities are the defining social and ecological phenomena of the twenty-first century: they house the majority of humanity, they contribute the lion’s share of carbon to the atmosphere, and they are peculiarly vulnerable to climate chaos. New York City is not alone in its vulnerability to flooding: almost all of the world’s great cities are sited on or near bodies of water. This should come as no surprise, since rivers, lakes, and the ocean have always been key to the economic and ecological health of cities. Thirteen of the world’s twenty largest cities are port cities. But this has generated a deadly contradiction that is one of the most-overlooked facts of the twenty-first century: the majority of the world’s megacities are in coastal zones threatened by sea level rise. Today, more than 50 percent of the world’s population lives within 120 miles of the sea; by 2025, it is estimated that this figure will reach 75 percent. In addition, urbanites all over the world are particularly vulnerable to deadly heat waves, whose intensity and frequency are increasing as a result of global warming, because of the “heat island” effect that makes urban areas hotter than their rural surroundings. Several decades of evidence suggests that people are migrating out of drought-prone areas in the developing world and into coastal cities that are prone to floods and cyclones. Whether we like it or not, anthropogenic climate disruption is going to dramatically alter the world’s cities, and it is here that the effects of climate change will be of most consequence. The New York that Hurricane Sandy struck was experiencing a second Gilded Age. It was a city presided over by Michael Bloomberg, the consummate corporate insider and power broker, who embodied nearly four decades of big business– friendly neoliberal urban policies. During that period, as Occupy Wall Street activists tirelessly pointed out, the city became a place of extreme economic and social inequality. It was also a site in which a variety of high-profile initiatives were undertaken to turn the city into a green metropolis. Yet inequality in the city continued to spiral. Today, New York is the consummate example of the prototypical social form of our age: the extreme city. The extreme city is not a city of a certain size, like the megacity or metacity, which designate, respectively, metropolitan areas with populations in excess of 10 and 20 million. Instead, it describes the specific character of the urban fabric. For instance, Tokyo and Lagos are both metacities, but the two are often taken as opposing poles in the contemporary urban imaginary, one a paradigm of technological sophistication and orderliness, and the other a sprawl of decaying infrastructure and informal settlements. By contrast, “extreme city” refers to an urban space of stark economic inequality, the defining urban characteristic of our time, and one of the greatest threats to the sustainability of urban existence. How a city copes with stratifications of race, class, and gender (or how such inequalities are left to fester) has everything to do with how well it will weather the storms that are bearing down upon humanity. It is in the extreme city that the most important struggles for human survival will take place. Nevertheless, this global convergence of urbanization and climate change, which I call the extreme city, has remained surprisingly invisible. Scientific literature on climate change has largely ignored the disproportionate contributions of cities to global warming, while climatology tends to assess the threat on a global scale and in the future tense, often in terms of how much the planet as a whole will warm by 2100, for instance. As a result, scientists actively suppress specific information about climate change in cities, statistically adjusting data collected from urban weather stations in global temperature datasets. In seeking to record the overall fluctuations of a planetary environment, science ignores the specific places where most of us live— cities—which also happen to be the sites of the most extreme transformation. This makes climate change seem distant and abstract, something that will happen in a remote future on a scale far removed from that of individual experience. But climate change is happening right now, and above all in the cities where the majority of humanity now lives. Many have already exceeded the magnitude of warming projected for the planet as a whole over the current century. Take São Paolo, the Brazilian metacity of over 20 million. São Paolo lies in a region that typically receives four times as much rainfall as Los Angeles, in a country that, with more than 12 percent of the world’s renewable fresh water, is often referred to as “the Saudi Arabia of water.” Yet São Paolo has suffered from a deep drought in recent years that is tied to anthropogenic climate change. The city’s main water reserves are perilously low, and in recent years the authorities have introduced water rationing. The origin of São Paolo’s water crisis is no mystery. Since 1984, researchers have linked potential declines in precipitation in southern Brazil to the deforestation of the Amazon. The rain forest transformed what would otherwise have been a desert into a lush environment, by releasing massive quantities of water vapor into the air. Yet 224,000 square miles of the rain forest—an area nearly one-and-a-half times the size of California—have been clear-cut since 1980. This unchecked deforestation, which disrupts the rain forest’s ability to recycle precipitation from the Atlantic, is one of the primary causes of São Paolo’s drought. Without adequate supplies of water, a city shuts down in a matter of days, and São Paolo has seen an exodus of “water refugees” as well as the proliferation of wildcat drilling for water that is polluting groundwater, a development that worsens the drought’s long-term impact. There is still much that the city can do to conserve water, but São Paolo’s plight makes the crisis tendencies of the extreme city dramatically evident. Despite this, the predominant outlook on urbanization remains surprisingly sunny, even utopian. Numerous paeans have been devoted to the economic and civic benefits of urban development, penned by writers who are frequently economists by training and consultants by profession. Most of them recognize the inequalities that have generated what Mike Davis calls our “planet of slums,” but they also characterize cities as the breeding grounds for new entrepreneurship that will provide solutions to the “challenge” of poverty. Their “smart,” technologically enhanced forms of urbanism will usher capitalism into a new era of “green” urban growth and produce a “city fix” for climate change: a new era of efficiency and resilience based on compact green cities. But these blithe predictions elide the glaring contradiction of capitalism’s destruction of nature, its material base. The perils of climate change in the city are either totally ignored in this literature, or cast as a mouthwatering opportunity for entrepreneurs to usher in the next wave of green technology. Neither “smart” urbanism nor good design alone will provide safe harbor from the storms increasingly breaking on our shores. “Tactical urbanist” interventions, however noble, will remain isolated oases in the vast desert of neoliberal urbanization. We certainly need technology and planning to help adapt to the coming climate chaos, but under present social conditions, these tools are more likely to be employed by elites to create architectures of apartheid and exclusionary zones of refuge. The War on Terror has shown us that the computer networks that are supposed to make cities efficient and green can be used not only against dissident groups and targeted populations, such as Muslims, but against the entire US population. The oppressive character of surveillance in the “smart” city is sure to be stepped up as climate chaos intensifies. Urban growth is driven at bottom by capitalism. As urban critics Henri Lefebvre and David Harvey have emphasized, the city plays a central role in solving the economic crashes that periodically wrack the capitalist system. The shiny new buildings and spiffy developments that are constantly popping up in cities are a fantastic sink for the surplus capital that builds up in this economic system. In other words, profits are not left idle in bank accounts; they are always reinvested in other profit generating schemes, like urban development. But the city is also the primary site for the feckless depletion of natural resources that characterizes this economic system, which is founded on unbridled compound growth. There is consequently no “city fix” without addressing overproduction. The city is where capitalism’s central contradictions play out and consequently where revolutionary movements have often been pushed into existence. This means that the movement for climate justice, which builds on anti-imperialist, antiracist, and feminist movements of the past, will necessarily grow through solidarities forged in urban terrain. To suggest this is to challenge the notion that the city is the antithesis of “nature.” We need to abandon such stale preconceptions. Not only are cities dependent upon nature, but they also structure our increasingly chaotic natural world. Climate change will unleash the greatest havoc in cities, but cities will also produce the most ferocious struggles against the inequalities of our urban age. There is no green capitalist exit from the extreme city, when capitalism is founded on the principle of “grow or die.” The world does not have a limitless supply of resources for humans to exploit. Urbanization and climate change are the two great products of this dysfunctional system, the central contradictions that define our age. And while the urban dwellers of the global South are the most vulnerable in the face of the gathering storms, climate extremes will affect all of humanity, albeit unevenly. After Hurricane Katrina struck New Orleans, geographer Neil Smith wrote that there is no such thing as a natural disaster: “In every phase and aspect of a disaster—causes, vulnerability, preparedness, results and response, and reconstruction—the contours of disaster and the difference between who lives and who dies is to a greater or lesser extent a social calculus.” “Disaster” connotes an unpredictable calamity that falls from the stars, but Smith suggests that so-called natural disasters are actually the product of all-too-tangible social inequalities. In New Orleans, for example, poor people (who are predominantly black) tend to live in low-lying, flood-prone areas, while the city’s wealthy (and mainly white) residents live in the most elevated (and safe) areas. Similarly, in New York, in true American form, many impoverished and predominantly black neighborhoods are isolated from the rest of the city, thanks to housing discrimination and segregation, and continue to be starved of resources and targeted by the criminal justice apparatus. Today, climate change bites down on these neighborhoods with particular ferocity, both in the form of dramatic disasters like Katrina and Sandy, as well as more subtle, protracted forms of environmental injustice like elevated mortality rates caused by increasing summer temperatures in cities. And the unevenness also extends beyond the confines of the city; after all, extreme weather is oblivious to political boundaries. Before Hurricane Sandy hit the eastern United States, it began life, as most hurricanes do, in the warm waters of the Caribbean. Gestating in the hot waters of the Antilles, Sandy knocked out power for 70 percent of Jamaicans and destroyed thousands of homes in Cuba and the Bahamas. But it was in Haiti that Sandy was most devastating: fifty-four Haitians were killed by the storm, more than the number of dead in New York City. With 99 percent of Haiti’s landmass already deforested, the rainfall quickly produced flash flooding, with death-dealing torrents of water rushing down denuded hillsides, washing away homes and burying people alive. Sandy also destroyed the island’s staple crops of banana, plantain, sugar cane, bean, and breadfruit, placing hundreds of thousands of Haitians at risk of malnutrition and famine in the following days and weeks. The extent of this damage was made possible by the destruction of social infrastructure (housing, schools, hospitals) on the island, a disaster that unfolded over many years rather than in the course of a single stormy night. When Sandy arrived, almost 400,000 Haitians remained homeless following the devastating earthquake of 2010, and many thousands were still sick from the cholera epidemic that UN peacekeeping troops brought to Haiti. Sandy made matters worse by destroying sixty-one cholera treatment clinics, while also flooding the streets of cities like Port-au-Prince, worsening the cholera outbreak by polluting water supplies. But the conditions that laid the ground for Sandy’s impact on Haiti reach back much further, troubling neat lines between anthropogenic (or manmade) and “natural” calamities. Ever since the Haitian Revolution at the end of the eighteenth century, when the country’s enslaved populace rose up and demanded that the “Rights of Man” of the French revolutionaries apply to all human beings rather than simply to Europeans, Haiti has been punished by the world’s ruling powers. This began when the French insisted in 1825 that the newly independent Haitian state indemnify slaveholders for the capital lost when the island’s slaves freed themselves. It extends as far as 1991, when the United States used the language of human rights to help block loans to the democratically elected government of Jean-Bertrand Aristide for clean water systems for the poor. Indeed, for years the US insisted on sending aid for Haiti exclusively to NGOs, which currently provide 70 percent of health care and 80 percent of essential services on the island. And US-backed dictators like François and Jean-Claude Duvalier were only too happy to oblige these demands to dismantle public services. But NGOs do not build infrastructure or public works, and, as a result, basic services in Haiti are now nearly totally privatized. Sandy’s high death toll resulted from the liquidation of public infrastructure by corrupt domestic elites and the United States. In addition, the threat of famine that loomed in Sandy’s wake is also linked to decades of underdevelopment. Since the 1970s, Haiti has been subjected to some of the most stringent free market reforms ever imposed on a country by international financial institutions such as the World Bank and the International Monetary Fund. In the name of neoliberalism, Haiti became a supplier of the cheapest labor in the western hemisphere for foreign and domestic export assembly companies. Public institutions providing education, water, and energy were privatized, and all obstacles to free trade were dismantled, including tariffs on food imports. This devastated Haitian agriculture, and the country went from producing 90 percent of its own food during the 1970s to importing more than 42 percent of its food today. Haitians are now the highest per capita consumers of subsidized US-imported rice in the Western Hemisphere. And as Haiti’s agricultural sector was decimated, Haitians fled rural areas in ever-increasing numbers, with the capital city Port-au-Prince swelling to more than 2 million people. When Sandy hit, over 350,000 of these people were still living in emergency camps established after the earthquake of 2010. Despite the proliferation of NGOs in Haiti, the majority of the city’s population lacks access to potable water, electricity, and health care. Haiti’s vulnerability to natural disasters is a product of its subjection to the savage doctrines of neoliberalism. Hurricane Sandy’s effect on Haiti is a striking example of how disasters are “combined and uneven.” Leon Trotsky used this phrase to describe capitalist development, a system that does not develop in a linear fashion but rather produces zones of abject poverty cheek-by-jowl with sites of shocking affluence. Such extremes are not a temporary aberration but an inherent feature of capitalism. In today’s neoliberal world system, gaping inequalities open up within and between countries. Hurricane Sandy’s course from Haiti to New York rendered national boundaries nonsensical, although they continue to structure how we think about weather. Haiti and New York were linked long before Sandy by centuries of imperialism and racial capitalism, but the hurricane wore the grooves of extreme inequality even deeper. If poverty is a kind of disaster, it is one that has been imposed on the people of Haiti. The plunder of Haiti, which left the island defenseless when Hurricane Sandy barreled down on it, is a product of the very same system that has amassed wealth, power, and a degree of insulation (for some) from disasters in global cities such as New York. Disasters such as Hurricane Sandy are combined and uneven, linking territories, cities, and nations whose fates are often diverse, and affecting their populations in highly unequal ways. Like capitalist development, combined and uneven disaster yokes together disparate stages, steps, and cultural forms. Extreme Cities explores conditions of uneven development and disaster in cities around the globe, returning always to New York, the capital of capital and a microcosm of the challenges posed by climate change to global cities. The first chapter, “Capital Sinks,” looks at the way in which real estate development, a key motor of contemporary capital accumulation, generates forms of irrational and unsustainable urbanization in cities like Miami, New York, and Jakarta. Chapter 2, “Environmental Blowback,” surveys the historical “conquest” of nature that has attended urban growth, spawning increasingly unmanageable environmental contradictions in places like New York’s Jamaica Bay and the Mississippi Delta south of New Orleans. This urban risk has been represented (and ignored) in different ways, which is the topic of Chapter 3, “Sea Change.” How are the perilous conditions of global cities made invisible by the global scale of scientific calculations? And how does the recent wave of celebrations of urban living as the key to global upward mobility similarly downplay these hazards? Exploring what are often regarded as exemplary efforts to stormproof Dutch cities, the chapter underlines the massive challenges facing even the best-prepared cities. I examine this even more closely in Chapter 4, “The Jargon of Resilience,” which casts a critical eye on cutting-edge efforts to adapt cities to the threats posed by climate change, looking in particular at the Rebuild By Design program in the New York region. If there are some good reasons for the buzz around the idea of resilience, we need nonetheless to question the extent to which free market ideology permeates the concept—and the adaptation efforts deployed in its name. In Chapter 5, “Climate Apartheid,” I turn to one of the most significant ways that climate change is already reshaping humanity, examining contemporary accounts of so-called climate refugees and tracing the appropriation of this term from its origins in humanitarian and environmentalist discourse to its current deployment by the military-industrial-urban security complex in the wealthy nations of the European Union and the US. If current state-led efforts to cope with climate change are inadequate and often draconian, where one may find alternatives? In “Disaster Communism” (Chapter 6), I look at mutual aid efforts in cities struck by natural disasters in order to assess the viability of community self-help when the state falls away. Finally, “Urban Futures” broaches the taboo but ultimately inescapable topic of retreat from imperiled cities, which I argue must be accompanied by the dismantling of a feckless capitalist culture of ruinous growth whose epitome is the extreme city. At the same time, New York can also make a strong claim for being the paradigmatic green city, thanks to New Yorkers’ dense living patterns and use of public transportation, as well as recent initiatives like the creation of more than 400 miles of bike lanes. But Hurricane Sandy revealed the hubris of celebrations of New York as a green metropolis, exposing a city completely unprepared for the larger threats posed by climate change. Like Hurricane Katrina before it, Sandy also showed the yawning social divisions that fissure cities, making a mockery of homogenizing accounts of urban resilience. Since the superstorm devastated us, much effort has been expended to help the city adapt to a warmer, more unstable world. Yet there has been relatively little discussion of the links between the city’s vulnerability to climate change, and the economic and social inequalities New York embodies. There has been even less critical analysis of the model of untrammeled economic growth that New York incarnates. The world is watching. How New York City attempts to mitigate and adapt to climate change—and also to respond to climate justice more broadly—will set key precedents nationally and internationally.